Everyone deserves a day to be lazy. Whether you're bogged down by a grueling college workload or you're working double shifts job during the week, a complete Netflix and chill day is a must. Recharging yourself not only requires marathon TV watching from the couch, but comfy clothes and plenty of snacks are also necessities. If you're no stranger to all-day lounge sessions, chances are Kigurumis are the product you never knew you needed in your life. 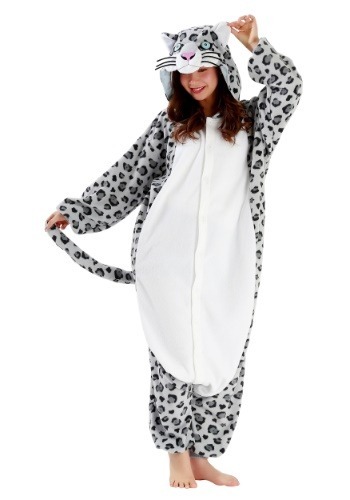 A perfect mix of a sweatsuit, pajama set and a costume, a Kigurumi is the best thing to wear when you don't have any pressing obligations or even if you have plans, it's perfectly acceptable to sport the snow leopard Kigurumi. Run to the supermarket, post office or to the bank dressed as one of the top predators in the food chain, as a fun way to spice up the day. It's the fiercest way to stock up on groceries for the week and the comfiest! Prowl the TV channel listings or hunt down your next delicious meal (tacos or pizza? Hmm...) as a snuggly "ghost of the mountain" and you'll be more rejuvenated than ever before. Made from supremely snuggly fleece fabric, the Kigurumi features all the basic Kigurumi-must-haves like a convenient snap-up front, attached hood and stretchy rib knit cuffs at the ankles and wrists. A long plush tail is attached to the back of the jumpsuit and the hood has striking light blue eyes like traditional snow leopards as well as a pink nose and black whiskers. If you find yourself in love with your life-changing Kigurumi and you want a whole closet full of them, we can help with that. We have a wide selection of adult Kigurumis! One weekend you can lounge as an Octopus and the next you can relax as a unicorn.